A gall in a plant is somewhat similar to a tumor in an animal. On forsythia bushes, the galls may develop along the stems or near ground level. It is not known exactly what organisms cause the galls to form but it is suspected that the ones near soil level may be caused by the soil borne bacterium called Agrobacterium tumefaciens while those further up the stem may be caused by a fungus in the Phomopsis genus. The major symptom is, of course, the corky textured growths called galls that are borne on the plants down near ground level and up along the stem. Plant tissue above the tumor may exhibit signs of dieback when the gall girdles an individual stem or the main trunk of the euonymus. Note that the plant does not automatically die from these galls. Generally a branch here and a branch there will die but the entire plant may survive in a weakened state for years. 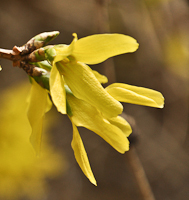 There really is no "treatment" for plants infected with forsythia gall. Once the symptom i.e. the gall shows up, it is too late to treat even if there were pesticides available for the purpose. So, the main control options rely primarily on preventing the infection in the first place. 1. Prune Off Infected Galls - To make the plant look better, you can cut off and destroy the infected stems below where the gall has formed. Sterilize the pruning shears with a one part bleach to nine parts water solution between cuts and before moving to prune other plants. 2. Destroy Infected Plants - Remove and destroy (burn or send to the dump) infected plants. Since the bacterium stays in the soil for years, replace it only with a plant species known to be resistant. 3. Sterilize the Soil - Commercial nurseries have potent chemicals known as soil sterilants available to them but, unfortunately, these are not used in home landscape situations. 4. Exclude the Problem - Purchase plants from reputable nurseries only. If someone wants to give you a plant, be sure to closely inspect them for any signs of galls. 5. Plant Resistant Species - Several landscape plants appear to have a high degree of resistance to bacterial crown gall. These would include barberry, hornbeam, true cedars, ginkgo, golden raintree, tulip tree, mahonia, spruce, linden, boxwood, Catalpa, beech, holly, larch, Magnolia, black gum, pine, Douglas fir, bald cypress, hemlock, birch, firethorn, redbud, smoke tree, sweet gum, deutzia, serviceberry, yellowwood, yew, and zelkova.